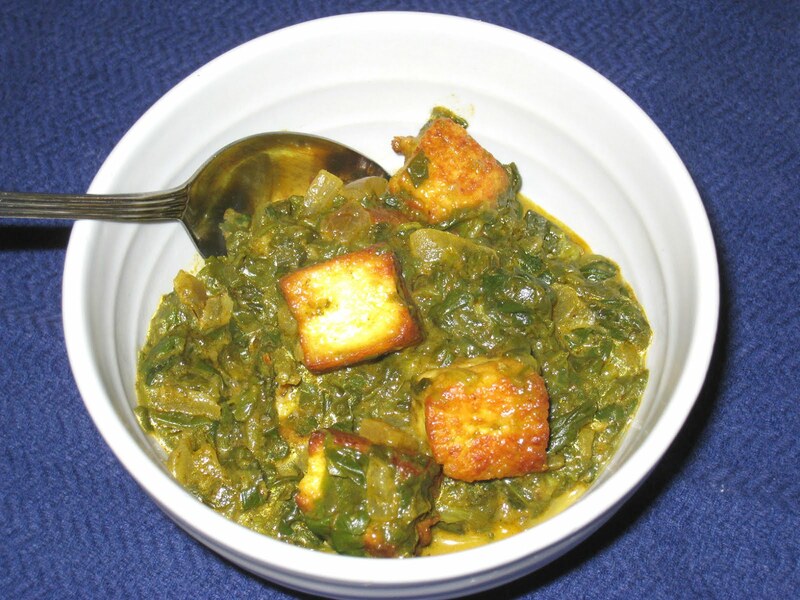 What makes this version of palak paneer different from the one I wrote about here? Just one main thing, really. In this version, the paneer is home made. Yep, I made it myself. And guess what? It was super super easy. And so much better than the pre-packaged paneer I bought last time I made this. It is soft and creamy and tasted so fresh that I had a hard time not eating it all right away instead of cooking with it. It took about half an hour to make, and then another two hours to press the liquid out of it. I was amazed at how simple the process was, and how quickly it came together. In fact, it is almost the same process as making ricotta, on which more later. A half gallon of milk makes about a pound of cheese. 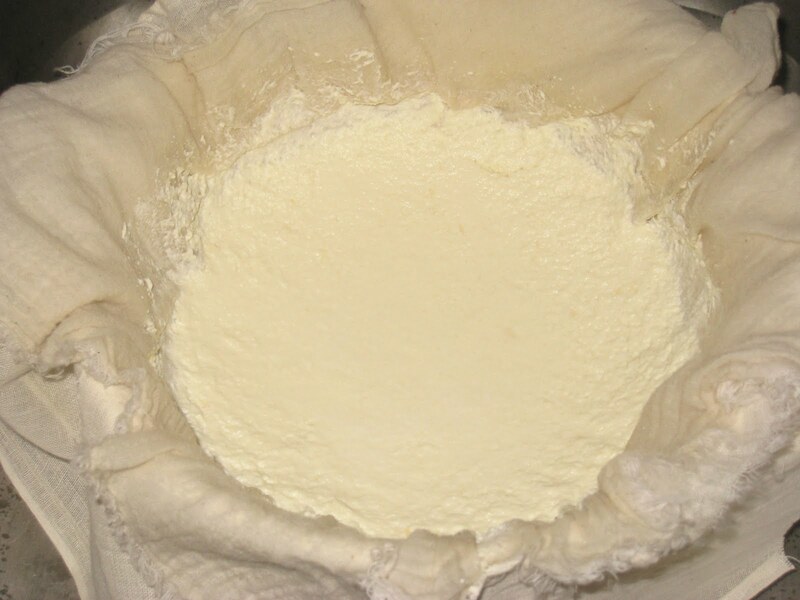 For paneer, you bring the milk to the boiling point in a large heavy pot. Remove it from the heat and slowly pour in the juice from 2 lemons (around 3 tablespoons if you need a more precise measurement). You can also use vinegar, but the lemon juice gave it such a freshness that I don't think you will get with vinegar (but don't worry, you will not taste any tartness or sourness from the lemon). Stir the mixture for a few minutes, until the curds separate from the whey, and then drain the mixture through a cheese-cloth lined strainer. With this first batch I made, the curds were minuscule and I wasn't sure it was going to work. But I poured it through the cheesecloth and did, indeed, get this lovely batch of cheese. Once it has cooled a little and the whey has drained out, wrap the cheese in the cheesecloth, squeeze out as much whey as you can, and shape it into a square (wrap the edges of cheesecloth to the side of the square rather than on top or bottom so it doesn't leave marks in the cheese) and put it on a flat board, then weigh it down with a brick, a large full can, or a cast iron pot. I used my cast iron dutch oven and it worked perfectly. Let it sit for two hours, then unwrap it from the cheesecloth. 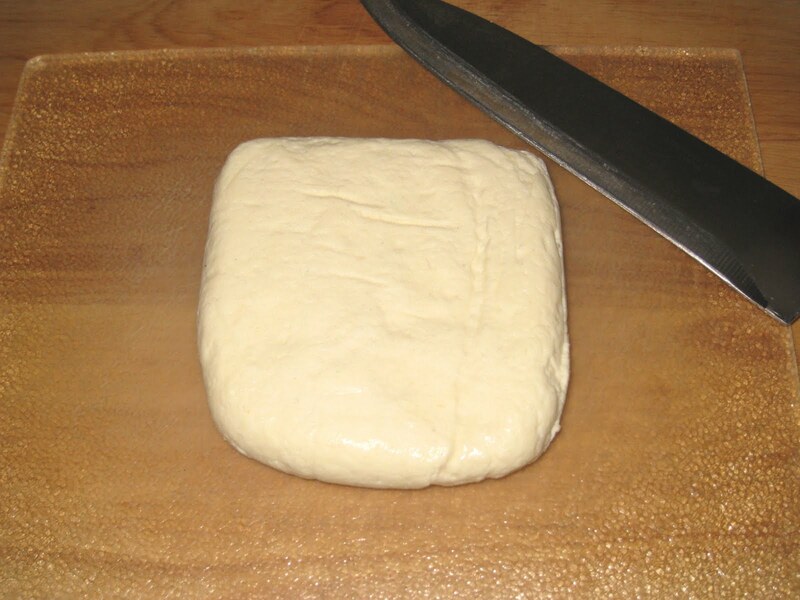 It is ready to use at this point, or you can wrap it in plastic wrap and store it in the refrigerator for about a week. 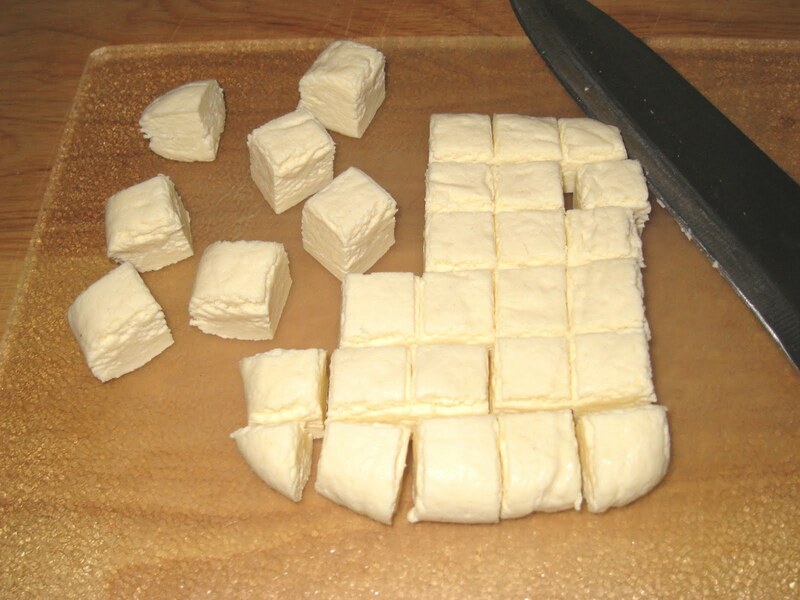 The cheese is easy to cut into cubes for frying. From what I have seen, this is the best method when using paneer. Frying gives the cheese a crisper texture and a toasty flavor. I was amazed at how well it stayed together, and I think this is where I was most impressed with myself for making my own cheese. 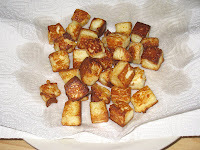 A word of caution: if you are going to fry the paneer before using it, use a non-stick or a well-seasoned cast iron skillet. It is pure protein and will stick like crazy to any other surface. I learned that the hard way. That is why these cubes are smaller than the cubes in the picture above. A good layer of each got left behind in the pan when I tried to turn them. At that point I transferred them to my non-stick skillet and the whole process went more smoothly. 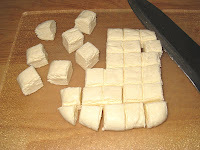 I am doubly thrilled to have learned how to make my own paneer. First, it tastes so much better than store-bought and second, the only store that I know that carries it is all the way across town and it is so much more convenient to just buy the milk and some lemons and make it myself.